The sockets in this 7 piece 3/8" drive 8 point SAE standard chrome socket set feature outstanding corrosion resistance as a result of our proprietary in-house plating process. In addition, Gray sockets are made from premium tool steel for maximum durability and feature a distinct brilliant jewellery-like finish. Precision tip ensures a tight and secure fit with the fastener. Made in Canada and backed by Gray Tools worry-free lifetime warranty. Contains Sizes: 1/8", 5/32", 3/16", 7/32", 1/4", 5/16", 3/8". Precision tip ensures a tight and secure fit with the fastener. Standard length bit provides access to fasteners in confined spaces. The 3/8" drive ratchet and attachments in this 4 piece set feature outstanding corrosion resistance as a result of our proprietary in-house plating process. Each tool has a distinct brilliant jewellery-like finish. The included high torque ratchet features a closed back which reduces potential ratchet mechanism damage from dirt and debris. Made in Canada and backed by Gray Tools worry-free lifetime warranty. The sockets and attachments in this 17 piece 1/2" drive 12 point SAE standard set feature outstanding corrosion resistance as a result of our proprietary in-house plating process. Each socket is made from premium tool steel for maximum durability and has a distinct brilliant jewellery-like finish. The included high torque ratchet features a closed back which reduces potential ratchet mechanism damage from dirt and debris. Made in Canada and backed by Gray Tools worry-free lifetime warranty. Husky 3/8 in. drive bits sockets are manufactured from chrome-vanadium steel and heat treated for added strength and wear protection; providing durability for a lifetime of hard use. Each bit has been heat treated and hardened for improved durability. The polished chrome finish resist rust and corrosion and easily wipes clean of oil and dirt. 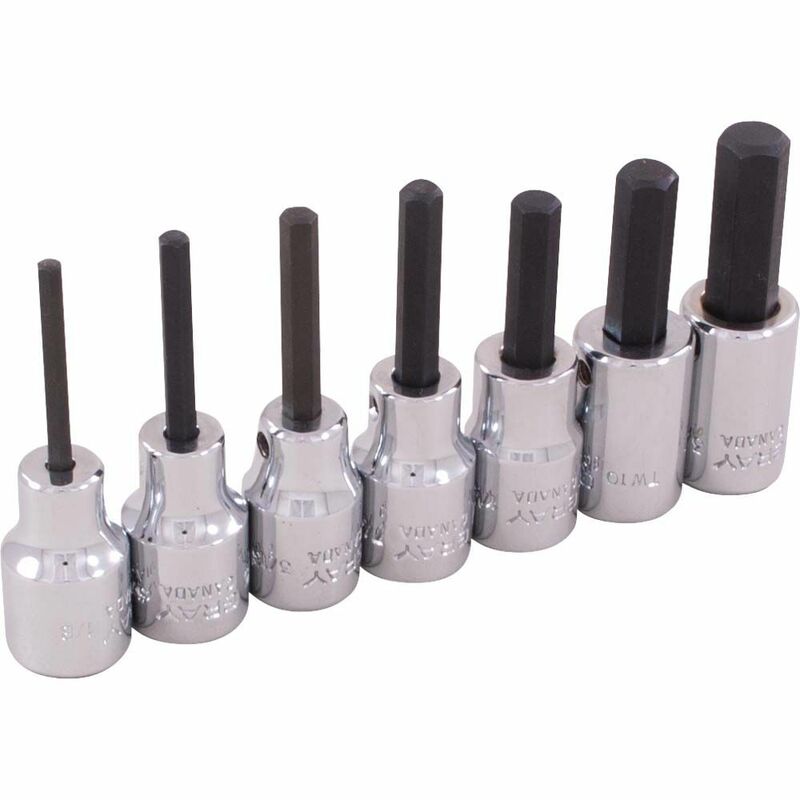 Socket Set Hex Head 7 Pieces 3/8 Inch Drive Standard Sae The sockets in this 7 piece 3/8" drive 8 point SAE standard chrome socket set feature outstanding corrosion resistance as a result of our proprietary in-house plating process. In addition, Gray sockets are made from premium tool steel for maximum durability and feature a distinct brilliant jewellery-like finish. Precision tip ensures a tight and secure fit with the fastener. Made in Canada and backed by Gray Tools worry-free lifetime warranty.